When attempting to run a non-UWP (Universal Windows Platform) Win32 setup installer to install a program, or trying to run a standalone or portable application on Windows 10 desktop, a warning dialog pops-up stating the following statement, with two options of “Get apps from Store” and “Install anyway”. Installing apps only from the Store helps protect your PC and keep it running smoothly. The warning message does not stop non-Windows Store apps from running or installing traditional or legacy desktop application programs. Instead, the “feature” is hope to ensure that users only install trusted apps to minimize the risk posed by non-vetted apps downloaded from Internet or received in emails. In Windows 10, you can choose to allow where you can get apps from. 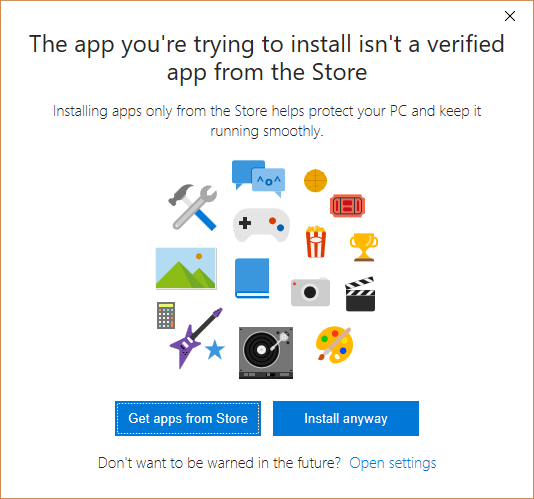 The warning pop-up message serves as intermediary choice between allowing apps from Windows Store only and allowing apps from anywhere. If you’re confident that you can manage the risk of installing programs in Windows 10 by yourself, you can disable the warning message that appears when installing apps from outside the Windows Store. Go to Apps -> Apps & features. You can skip steps above by directly clicking or tapping on Open settings link after “Don’t want to be warned in the future?” message at the bottom of warning dialog. Under “Installing apps” section, select Allow apps from anywhere.